Jefferson City Hall is located at 317 South Main Street, Jefferson, WI 53549; phone: 920-674-7700. Photo: Richard C. Smith House, ca. 1950, 332 East Linden Street, Jefferson, Wisconsin. 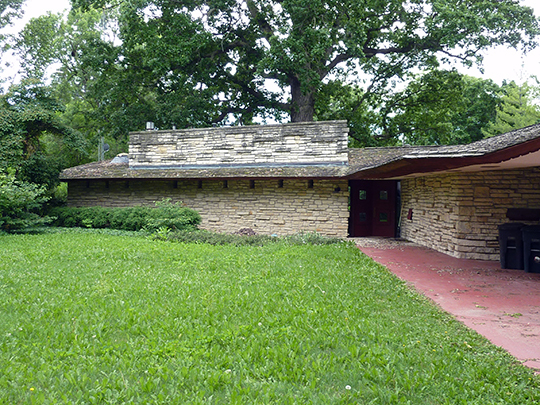 Usonian style house built from a design by Frank Lloyd Wright.. Listed on the National Register of Historic Places in 1979. Photographed by User:James Steakly (own work), 2010, [cc-by-3.0 (creativecommons.org/licenses/by/3.0)], via Wikimedia Commons, accessed March, 2013. Jefferson, the county seat, is a pleasant city of about 3,000 inhabitants, delightfully located at the junction of the Crawfish and Rock Rivers, in the central part of the county, surrounded by a rich farming country, thickly settled and contributing vast resources to swell the general prosperity of the county seat. The first settlement of the present city was made in 1836. December 18 of that year, Rodney J. Currier, Daniel Lansing, Robert Masters, with Imogene, his daughter, David Sargeant, Peter Rogan, Rufus C. Dodge and Edwin and Alvin Foster came from Bark Mills and Milwaukee and distributed themselves about Jefferson and the immediate vicinity. On June 13, 1937, Silas R. Stevens, following in the wake of these pioneers, landed at the residence of Robert Masters, located on the Rock River, about one mile below the present city. In 1837 E. G. Darling piloted a scow from Hebron on Bark River to Rock River, thence to Jefferson, where he took up permanent abode. He was accompanied by Melissa and Marion Brown, half sisters, Alonzo Brown, half brother, Lavina Carpenter, Edward Sawyer and David Bartlett. The scow was also laden with their household goods and the frame of a house, which was fashioned at Bark Mills and brought to Jefferson ready to be completed and occupied. The emigrants took possession of a log shanty said to have been built by James and Peter Rogan a year previous, and prepared to locate and finish the house they brought with them. The building was completed in the fall and used as a tavern. In 1838 the population of the settlement was increased by the arrival of William Sanborn, a man named Minor, who remained but a short time, Harvey Foster, with his father, Hopesdale Foster, possibly Ebenezer M. Seaton, and others who have left no record of their advent to guide the historian. In 1856 the discussion as to the location of the county seat, which had been in progress for some time previous between Watertown and Jefferson, culminated in a vote resulting in the selection of Jefferson, though not without accusations of improprieties by those favoring Watertown. The History of Jefferson County, Wisconsin, Western Historical Company, Chicago, 1879.